My T-shirt has a best friend..who knew? I was recently in one of my favorite stores. In my group of friends we refer to it by its little known french name Tarjay…you may know it as Target. A couple of my friends refer to it as the “hundred dollar store” since that is what their bill always seems to be. I must be getting rusty since one of my recent outings there was just one dollar! 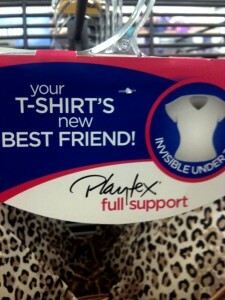 So I was ambling down the aisle the other day and much to my surprise I discovered that my t-shirt has a best friend. Really? Does this mean I have to arrange play dates? Turns out I was in for about 15 minutes of entertainment. What can I say, I am easily amused. Where was I you ask? I made the mistake of thinking I could just whip into the “lingerie aisle”, pick up a couple of bras in my size and be on my merry way. Yes, true confessions. 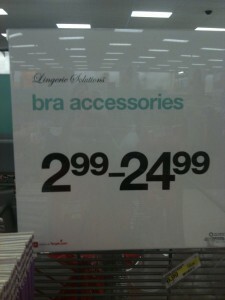 I buy my bras at Target but maybe for not much longer. 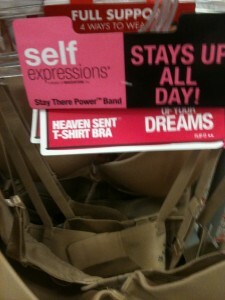 Bra shopping in and of itself can be maddening. Once you find one you like and fits you well you had better buy all you can afford because the evil bra makers will discontinue it if they find out it is well liked. I don’t understand their logic but that is what seems to happen to me and lots of other women. 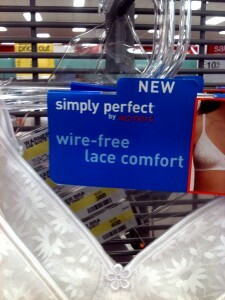 So this is the first sign I see that led to believe there is whole new world of bra relationships out there! Not just my t-shirts BFF but her NEW BFF! Wow…what have I been missing here..there is a party in my closet that I was NOT invited to! Of course no relationship would be complete without that helpful bra! 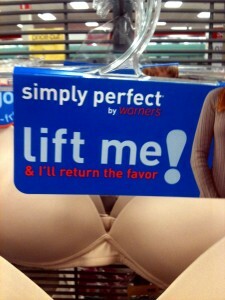 Lift me and I’ll return the favor! This was getting good. Who knew this would be so entertaining. 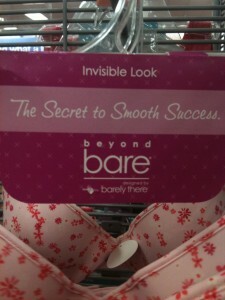 Turns out there is one that gives away the secret to SMOOTH success! And its beyond bare. Funny I thought beyond bare was just plain naked. This next one has it all wrong. 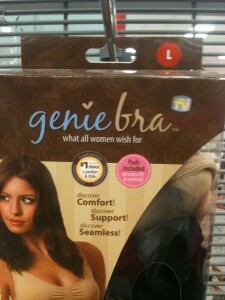 I got news for the Genie bra..this is not what all women wish for. Last time I checked most women wanted a cleaning lady, a nap and dinner ready when they got home. Maybe that has changed since the bestseller “The 50 Shades of Grey ” has come out. I’ll let you know after I read it. Who wants to lend it to me? 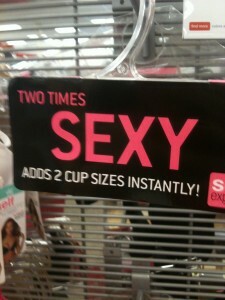 On top of everything else now our bras need to be accessorized. Give them a BFF and they become high maintenance. $24.99 to accessorize my bra? Not happening here no matter what her BFF says. And of course we have to have the “Snooky” in this group of bra friends. Last but not least we have the over achieving bra. It is the bra of your dreams, stays up ALL day and I would guess the night as well, it self expresses and is heaven sent. I did end up finding two bras, not sure if they are becoming my t-shirts new BFF. I’ll let you know. In the meantime I have to check out this new store that actually gives its bras names like Hannah, Misty and Suzi. “What a pretty name, were you named after a relative? “No I was named after Mommy’s favorite bra! Gotta run…I hear a party going on in my closet! Never had a mug shot before but I do now ! This past January I had to renew my driver’s license. Last time was easy. I did it all through the mail. This time I had to actually go to the DMV, sit forever, pay my money, have my photo taken and finally get my new driver’s license . Well I sort of got my new drivers license. They gave me this 81/2 by 11 piece of paper to carry with my expired license until the new one arrived ..drum roll…in the mail! WHAT?? Took me exactly 5 minutes to misplace that piece of paper. One good thing though, I drove the speed limit until my new license arrived since I had no proof I really had a valid license. I hate my new driver’s license. I hate the photo in particular which makes me want to hide my license from everyone. Virginia unfortunately issued driver’s license to many of the terrorists involved in 911, so there are new security measures in place before you can get a license. You have to jump weight loss through many many hoops. This is not bad, just annoying. I only had to jump through a few because I had a valid license. BUT if I had waited and let it expire it would have been horrendous which is why I found myself enduring the endless wait the day BEFORE my license expired. Yes I have a little problem with procrastination plus I was mad that I couldn’t do it through the mail like last time. So one of the new measures taken for security purposes is to take the photo in black and white, no hats, scarves or anything on your head and NO SMILING. I didn’t have a previous mug shot but I sure have one now. I have heard this makes you easier to recognize. Really? I think it makes me look dead with my eyes open. I showed it to a few people and they said it doesn’t even look like me. I now use my military id if someone needs to see one. The photo is also in black and white and not much better but its smaller and fuzzier and less embarrassing. So if you ever wondered what your mug shot would look like, feel free to come get a license here in Virginia. 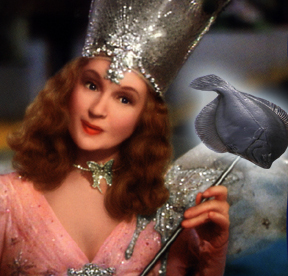 Glenda the Good Witch was right…. We all know Dorothy from the Wizard of Oz. Glenda the Good Witch told her to “follow the yellow brick road” which Dorothy did for the most part with a few detours along the way. After surviving the wicked witch , the flying monkeys and picking up a few hitchhikers along the way ( the know it all, the drama queen, and the emotional one) she finally made it to Oz. Glenda the Good Witch was right of course. We all have the power and wisdom within us to do what we know to be the “best” thing for us. In the spirit of true confessions I will admit that I have often disregarded my inner wisdom because what it was telling me to do was not popular, in style or often done. I will also confess that most of those decisions weren’t my best. The best decisions came from my Gut, that all knowing place that told me it was what was best for me. One of those was marrying my husband despite the fact that during our dating relationship we had not spent more than 4 consecutive days together in our less than 2 years of dating. Three children, 5 grandchildren and 32 years later I am so glad I trusted my Gut ! 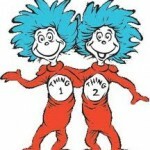 If you have read this far you are probably wondering what this has to do with triathlons, marathons or life in general. By the way..notice this falling on Monday so it IS a Monday Marathon post. The good news is I am officially registered for the Marine Corps Marathon! Registration opened at noon on Feb 23rd and I was registered by 12:05. Good thing too because the race filled in record time. The trusting my Gut part comes as I train for my first marathon. I have done 5ks, 8ks, 10ks and 2 half marathons so training for a race is not unfamiliar territory. Yet this one is different. My Gut tells me there is no wiggle room in the training, no cliffs notes, no all nighters, no cramming the training in a ridiculous short amount of time. My Gut is also telling me to train smart and run smart. Enter a gem of a book I found called ” Marathoning for Mortals”. Unlike most running books it is written with humor, honesty and real life examples of what not to do. I have been run/walking in my training so far. Running 3 minutes, walking 1 minute, repeat. A good way to get back into it after several setbacks this fall and winter. My original plan was to progress towards all running. Maybe not. The “MM” book has 4 training plans and one is the run/walk for marathons. Really??? I mean really?? Can I get past the “shoulds” or what people will think if I run/walk this marathon? No decisions yet..possibilities , options but no final decisions. Still having conversations with my Gut and my body, which sometimes says “enough already”! Where is Glenda when you need her? Oh and does anyone know where I can get a pair of ruby running shoes?? Stay tuned! Mulit tasking seems to have become an art form despite all the studies that say our brains really can’t perform several functions at the same time. Let me rephrase that. Our brains can’t handle doing several tasks at the same time and do them well. Still we try. All of our electronic gear makes us think we can do it all without cloning ourselves. 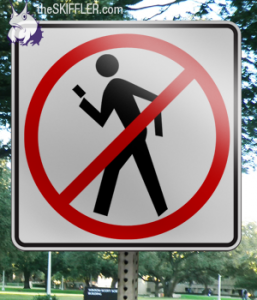 We can walk and text…NOT as evidenced by the video below. I’m glad she wasn’t outside where she could have fallen into a ditch, walked into oncoming traffic or gotten hit by a car. Her cell phone took a bath ( not good) and she was embarrassed ( survivable) and this video has pretty much gone viral so she will never live it down. On the plus side she gave us all a good laugh. Speaker phone is another mulit tasker tool..useful when on perpetual hold..not so useful by lazy people who refuse to hold the phone to their ear and then FORGET to tell you that you are on speaker phone and then EVERYONE hears things they are not suppose to hear. 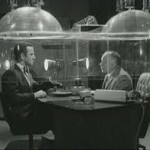 Not to mention you can hear the person you are talking to doing everything BUT listening to the conversation. So how does this relate to Marathon Monday ( once again falling on a Wed)?? Quite frequently I take my dog to the very end of a street near our home. There are several vacant lots so its a good place to play. Since its the very end of the street no one comes down there unless they live there or are lost so there is very little traffic. So Max and I are playing and I see a woman out for a run heading towards us. We are blatantly visible. By the way, Max is a pretty good size golden retriever..a little hard to miss. She had her headphones on and was NOT paying attention. Max , of course, as all goldens do was absolutely certain that this person would be more than happy to pet him, pay attention to him etc. Goldens operate on the toddler rule “Its all about me, no matter what, if you came to see Jenn, you really online pharmacy came to see me”. I was about a second too late from grabbing his collar to keep him from running up to this gal. He conveniently became deaf to the “come” command. She screamed..turns out she is afraid of dogs. She yelled this to me as I grabbed Max.. she continued to the end of the street (not too far) back up the road and on her merry way. I felt horrible the rest of the day. I should have had him on his leash, how stupid of me and a few other choice phrases, until I had a realization. She wasn’t paying attention. She KNEW she was afraid of dogs. We were visible and yet she kept running towards us because she was not paying attention, had her music up so loud I could hear it clearly and she was totally zoned out much like the woman texting . When running alone, no matter what time of day…BE AWARE OF YOUR SURRONDINGS.…duh! If you are afraid of dogs, cats, deer, construction workers, snakes, clowns..whatever…be AWARE and don’t keep running towards them if you see them ahead. Duh again! Know your route. I don’t care if its the safest neighborhood around, don’t run in isolated areas. Are you being fully present with what’s important? Are you aware of your surroundings and the people around you? Are you doing any of these tasks well? Or keep multi tasking and watch yourself fall into a hole while running or into a fountain while texting..I’ll be the one LMAO nearby. By the way.. I am allowed 1 or 2 cranky blogs a year.. Guess this counts for one! So its Marathon Monday on a Tuesday , Wednesday. Don’t say I didn’t warn you that some of these would be late. Hey life happens and around here it seems to be happening in many dimensions. Perhaps that’s why today is one of those days when I wish training for an athletic event WAS like studying for a final exam. Let’s be clear here , I am NOT talking about the way “normal” people study for a final exam. I am talking about the good intentions of keeping up with the reading, doing everything on time, having that date in your calendar three months ahead of time and then procrastinating until you pull an all nighter studying, and can barely keep you eyes open for the actual exam. Obviously I grasped the concept of a run on sentence from English 101. Somehow that doesn’t cut it when training for a race. You can procrastinate all you want but pulling an all nighter won’t help a bit. And you won’t get a decent or even a semi decent race time. What you will get ( if you decide to participate) is sore muscles, a possible injury and lots of self loathing. I mean a LOT of self loathing. The weather is unpredictable and I had better work around it since I don’t live where its 65-70 degrees everyday, sunny with no humidity. Okay even I will admit that last one sounded a bit shallow and non athletic antibiotics sounding. I am not a fashionista. As a matter of fact a quick look at my closet will tell you I have more work out clothes than anything else. And most of them are cute. Actually I am just happy if I color coordinate..hey whatever works to get me out the door. One more thing I know for sure. Guys do NOT care in the least what they wear to workout in. AND they don’t care how it smells. They might care about the right kind of shoes but that’s about it. I speak from experience on this one. My husband must own 1000 t-shirts. He will wear ONE until it falls apart. At this rate he will have to live a long time to wear out all his t-shirts . He shocked me the other day by wearing what appeared to be a new one. It was new in the sense that it had never been worn but its logo gave it away. Army 10-miler 1995. Yes a 15 year old “NEW” t-shirt. A couple of days ago he called all stressed out. Someone had stolen his running clothes. His dirty, smelly already worn a couple of times running clothes. I asked him if he had seen anyone in a hazmat suit carrying a package at arms length? Find that person and he will have found his clothes. Either someone at his office gym had no sense of smell or some woman walked by, got a whiff and in an act of bravery threw them out. Darn the bad luck! So since the fine art of putting it off will NOT work I got on the treadmill today and will again tomorrow and the next until the weather allows me outside. If you see me at the gym stop and say something motivating…oh and notice my cute workout clothes! The ancestor of Red Bull...I remember it well! Marathon Monday : If life is a marathon I desperately need a rest stop. Welcome to my Marathon Monday Posts. Happy Monday. While I am not officially registered for the Marine Corps Marathon I am already committed to it so starting today and every Monday until the marathon and possibly beyond that you will be seeing my “Monday Marathon ” posts. These won’t always be about the actual marathon. And they might not always make it here on a Monday. Every Monday’s post will be a surprise, even to me! Whatever pops up about the marathon or life in general is fair game. If life is a marathon I AM in desperate need of a rest stop. The vision of that is so appealing. I am working, working , working, cleaning up, cleaning out, cooking, running errands, my mind is going in a thousand different directions, phone calls, e-mails, paying bills, crossing off my things on my to-do list, adding things on my to-do list, adding things I have already done just so I can cross them off and then as I round the corner in my house…a rest stop. Everything fades away and someone offers me a drink of water, an energy bar, there is a place to sit and put my feet up, it is quiet, my breathing slows, my mind empties…a candle is lit. Sounds great . I was all ready to write about how this rest stop bit could be one of my New Years Resolutions but since its Jan 3rd that might be a problem. I am already 3 days behind. MMMM…not really, at least not for me. My New Year always starts on the 4th of Jan. Really..it truly is the start of a new year for me because ITS MY BIRTHDAY!!! Feel free to send birthday wishes tomorrow…I will not grow old before my time so wait until tomorrow. Today,however is my grandaughter, Summer’s 5th birthday. She was my gift, a day early in 2006. Best gift I ever got!! Sounds great. My resolution for 2011 is balance. Where do I start? mmmm my mind is wandering already. Balance is a great word for 2011 but it is not quite doing it for me. If you know me then you know I am not a one word kinda gal. That would be my dear hubby who is quiet anyway and with me around, well, he is down to one word here and there. A phrase for 2011 would suit me better. So here it is! This is my rest stop. This is what is getting me out of bed in the morning. Huh? Let me explain. Creativity…anything that gets my juices going..writing, reading, baking, scrap-booking….music, walks with my dog. even running. Running doesn’t “slow” me down but it does pace me with a comforting rhythm. The anticipation of being creative enough to fit this into each day is incredibly energizing. So there you have it. I found my rest stop. Its up to me to keep it fully stocked and always available. It is my respite. You can do it too. Its free, its fun, its essential. 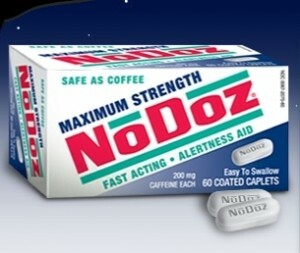 Take one right now and promise to take one, two or three everyday. There have been many times when I have not wanted to run , bike or swim. Life gets busy , the to do list gets longer and workouts get put on the back burner. Since April 16, 2007 , whenever I need a push I remember to get out there and do it for those who can’t. 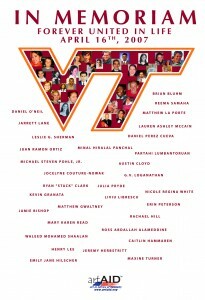 On April 16, 2007 a familiar place to our family and most of Virginia experienced a horrific tragedy when a student at VA Tech took the lives of 32 innocent people. Our oldest daughter graduated from Tech. Our second daughter had been there in 2006 in the same dorm. My heart ached for those families. I desperately wanted to do something for them. I wanted them to know that their loved ones would not be forgotten. So I prayed and I ran. I dedicated a run to each one of those who lost their life that day. Before each run I read their biography posted by the family. I looked at their photos. They were intelligent, fun, energetic people. They had amazing futures ahead of them. Many were adventuresome, and athletic. Community leaders and contributors. They had so much to give to us and the world and in an unbelievable moment of violence it was taken away. So I ran because they could not. Those runs gave me immense peace and deep gratitude for the simple things I often missed while putting one foot in front of the other. I ran with purpose and prayer to honor their lives. That week in April was one of grief and happiness for our family. On Friday April 20th everyone was encouraged to wear Virginia Tech colors to honor those who lost their lives on April 16th. 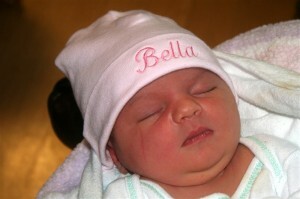 It was also the day we welcomed our 4th grandchild into our family. Her name had been picked out months before but it held special meaning that day. I thought of all the beautiful angels we honored that day wearing maroon and orange. It was everywhere. Dedicate your next workout to someone who can’t. You will find new purpose in each stride, each push of the pedal, each swim stroke. Do it because you can.